If you are looking for a traditional, luxurious and off-beat experience amidst acres of greenery, Kurumba Village Resort promises you just that. With a stunning infinity pool, a specialized Ayurvedic spa, and rustic, yet elegant, tribal-style cottages, this resort is everything you are looking for on your vacation! Wake up to the sound of leaves rustling, the fresh aroma of spices, and the most hospitable staff that you'll find. Enjoy this unspoilt setting in Coonoor and go back with memories that will last you a lifetime. Kurumba Village Resort will never disappoint you! 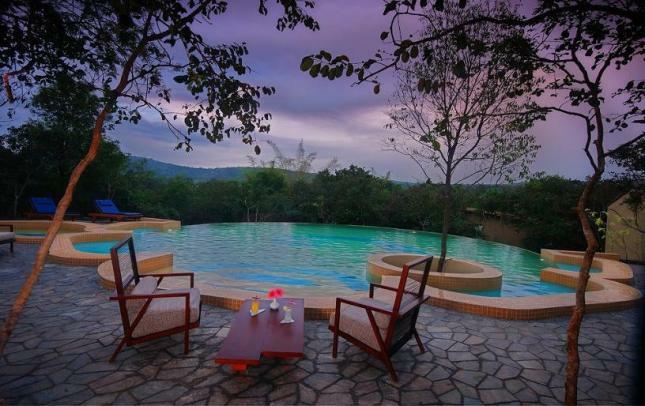 The Windflower Jungle Resort & Spa in Bandipur combines ultimate luxury with a unique offbeat experience. Disconnect from the rest of the world, unwind to the sound of birds chirping, and enjoy the surrounding wilderness. Other activities such as jungle safaris, indoor & outdoor games and spa treatments also await you at this attractive resort. So, what are you waiting for? De-stress and rejuvenate in the lap of nature at this elegant getaway in one of the South's premier wildlife destinations! Overlooking the Banasura backwaters in Wayanad, Sharoy Resort offers a pristine setting amidst natural surroundings. Experience pure bliss while you enjoy spectacular views of the vast backwaters from the infinity pool. Also awarded as one of the top honeymoon destinations in Wayanad, Sharoy provides the perfect setting for a romantic getaway with your loved one. Apart from being home to one of the best infinity pools in the vicinity, the resort also offers world-class hospitality that will make you feel at home. 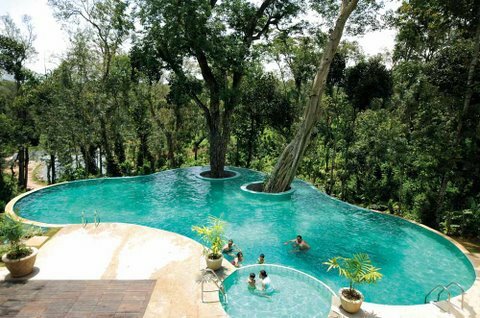 Whether in Wayanad or elsewhere, there's no reason not to head here for the weeekend! Experience luxury, bliss and acres of forest ahead of you while you relax in the temperature controlled infinity pool at Vivanta by Taj-Madikeri. With the mist-clad hills right in front, there's nothing else you could possibly wish for. Apart from the pool, this luxury retreat has much more to offer, including a spa and an interesting activity centre with a range of unique activities. All in all, whether you want to spend a relaxed weekend or indulge in various adventures, this is where you should be. 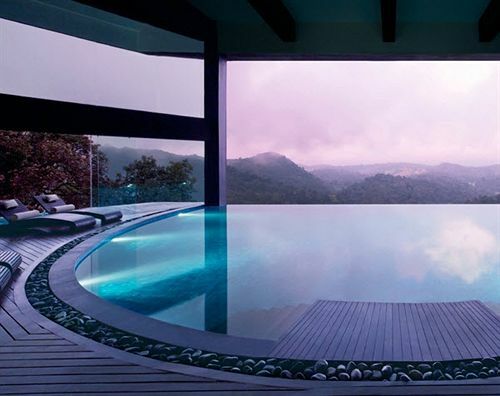 The Vivanta by Taj-Madikeri is truly one-of-a-kind! 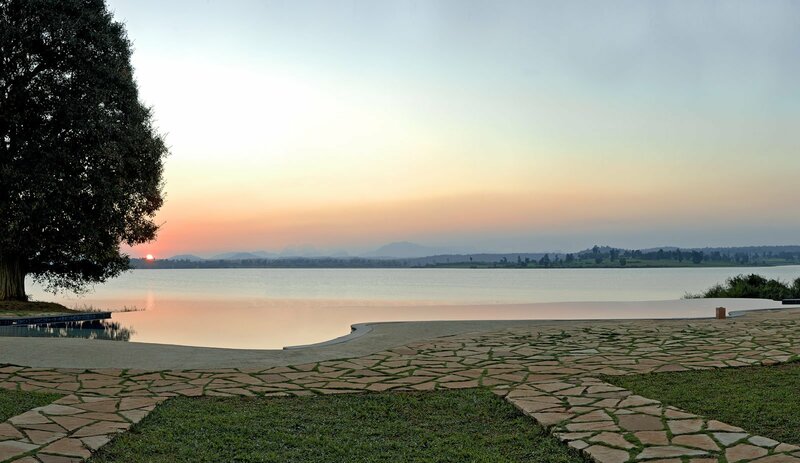 Bordered on two sides by the Kabini River, the infinity pool at Orange County, Kabini, offers spectacular views of the waters and an experience like no other. Combining a wildlife experience with ultimate luxury, guests can unwind in style after a long week. Once you've had enough of the infinity pool, relax in an open-to-sky jacuzzi or enjoy your very own private pool hut; this resort has a lot in store for you. From the time you step foot into the property till the time you have to leave, Orange County, Kabini promises an experience that will leave you awestruck. Spread across 25 acres of coffee estate, the Windflower Coorg offers a unique experience to its guests. 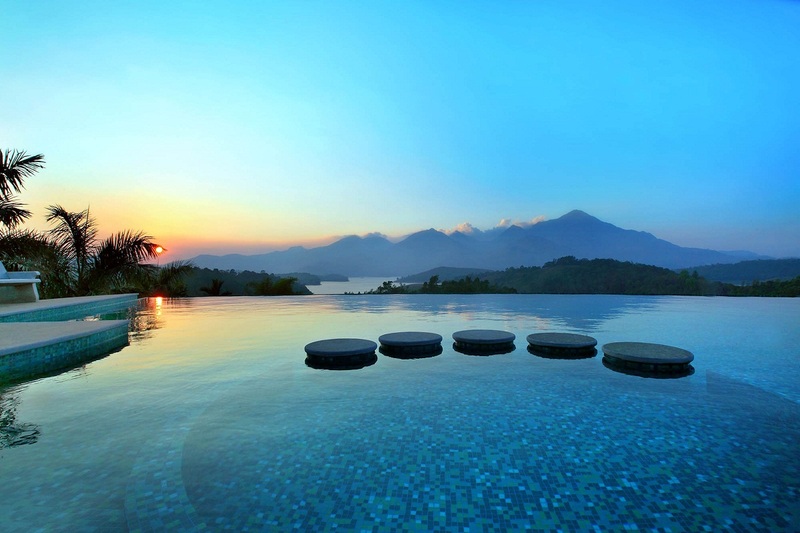 The infinity pool in this resort is definitely one of its highlights. Overlooking nothing but lush greenery and acres of plantation, you're sure to have the best time. Also featuring a lake within the premises, guests can spend a day fishing. Here, amidst nothing but wilderness and the deafening silence, one has a chance to get in touch with nature while enjoying the comforts of a modern, opulent holiday resort. 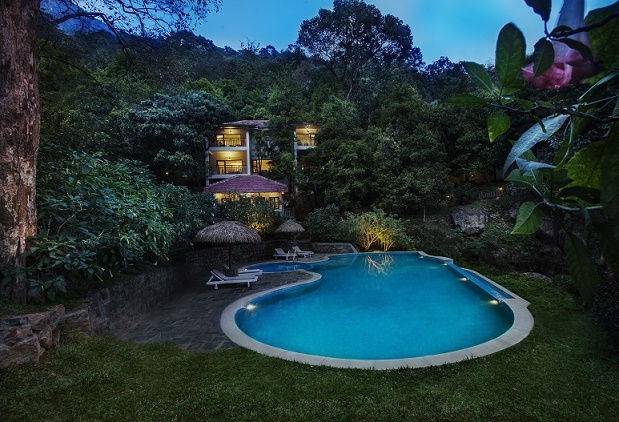 If tranquility and hospitality are what you're looking for, you're sure to find it here, at the Windflower Coorg. 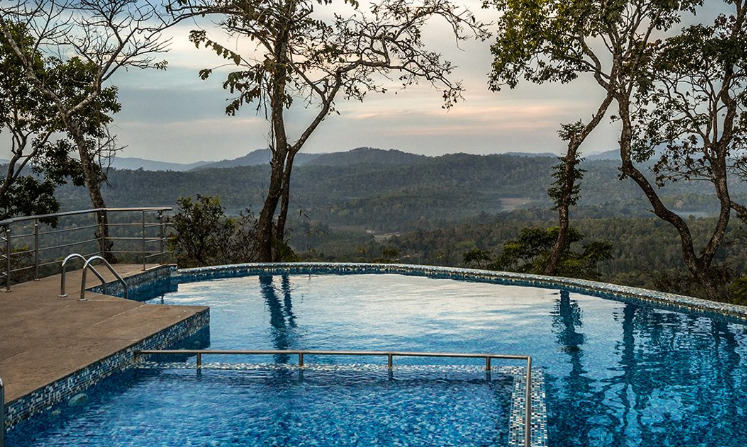 The infinity pool at Porcupine Castle allows you to unwind in style, amidst the mountains and valleys of Coorg. 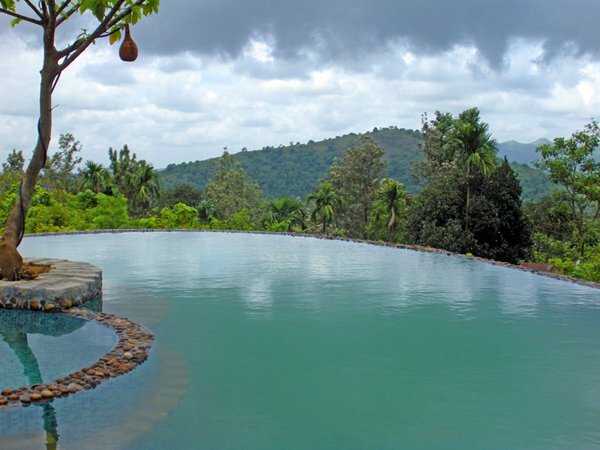 Set on a 300 acre coffee plantation, one has a chance to enjoy the lush greenery and the soothing sound of birds chirping. 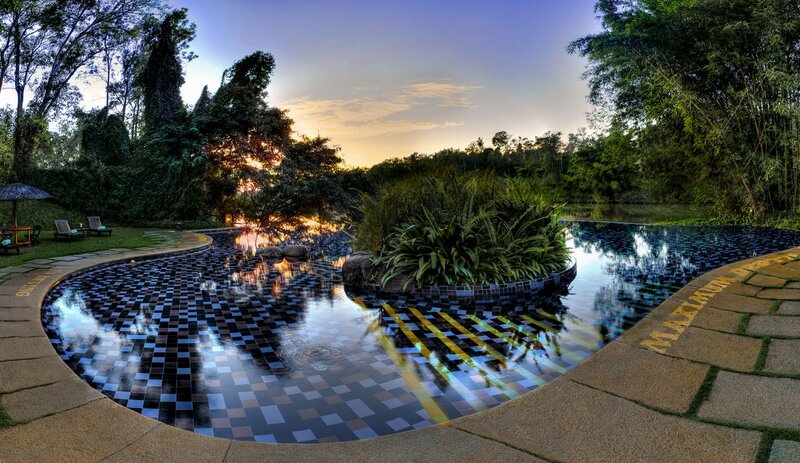 Loosen those muscles, take a dip in the clear water, and be prepared to be mesmerized! The Porcupine Castle offers a one-of-a-kind experience that will keep you coming back for more. Enjoy a guesthouse experience and at the same time lounge in the spectacular infinity pool overlooking the surrounding hills and valleys. If you're looking for a quiet and peaceful time amidst the mountains, Annapara Home Stay (or Elephant Rock) gives you just that. Located in Vythiri, in close proximity to the Chembra Peak, this home stay promises a holiday like no other. Fresh air, mist-clad hills, and nothing but greenery - what more do you need? So, pack your swimming costume and head here for a memorable stay with a homely touch. Orange County, Coorg, exudes luxury and class. Enjoy the exclusivity of the fantastic infinity pool that borders the Dubare Reserve Forest while you witness stunning vistas of the surrounding plantations. Whether it's a romantic getaway with a loved one or a solo adventure, Orange County provides the perfect setting. Falling nothing short of pure opulence, an experience in Orange County, Coorg is an experience that will be etched in your memory forever. Let yourself be pampered after a long and tiring week, enjoy the awe-inspiring setting of the resort, and go back refreshed and revitalized!